Welcome to the CUNYMath website. CUNYMath exists to provide students and faculty in the City University of New York with a central location for information about mathematics and resources that CUNY and the Internet have to offer. Use the menu to find resources about mathematics, math departments, registration, assessment tests, departmental syllabi and more. Thanks – I might bug you occasionally about plugins and whatnot. This will likely be a slow transfer over the coming weeks. The eventual plan is to bring this together with Math Matters, yes, and have everyone math-oriented talking under one umbrella. This is exciting to see, Michael. Please let me know whether the Development or Community teams on the Commons can help and/or advise you in any way as you transfer content and set up your community here. Is this effort associated with the Math Matters group? 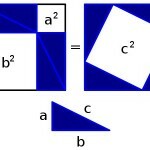 A picture proof of the Pythagorean Theorem, one of the most celebrated results of ancient mathematics.